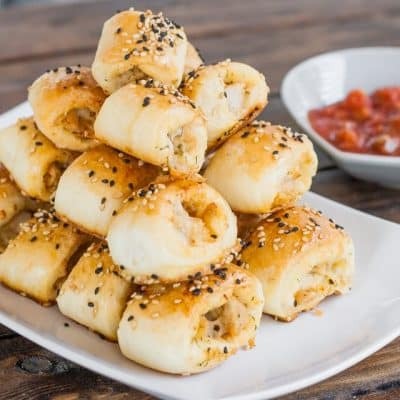 These asiago cheese and turkey bites make the perfect little appetizers. I love turkey breast and it’s a very healthy and lean meat. I like to buy the boneless skinless turkey breast and use it instead of chicken, I think its flavor is much better. Now these turkey bites are to die for. They are so flavorful and just simply delicious. My husband and I (and the dog) could barely hold back long enough to take pictures. To make them really tasty I used lean turkey breast which I cooked in butter, yes butter, everything tastes better cooked in butter. Then I added hot sauce and garlic chili sauce, asiago cheese and dill. They were so good, and they make the perfect little appetizers. 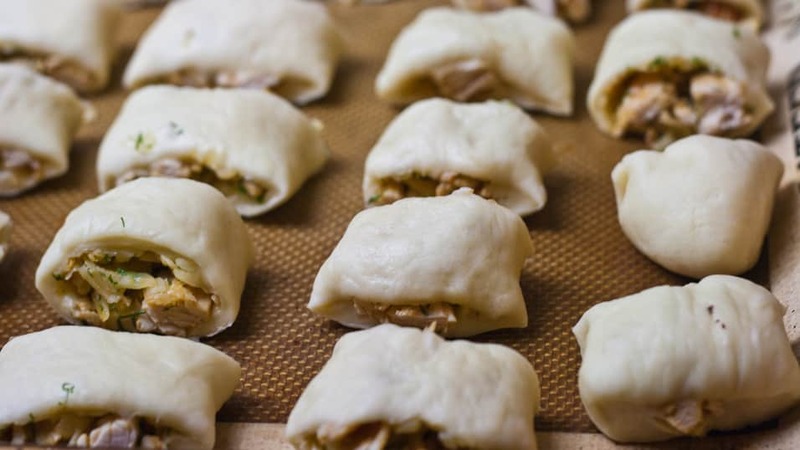 If you want to save time making these, you could use puff pastry instead of making your own dough. 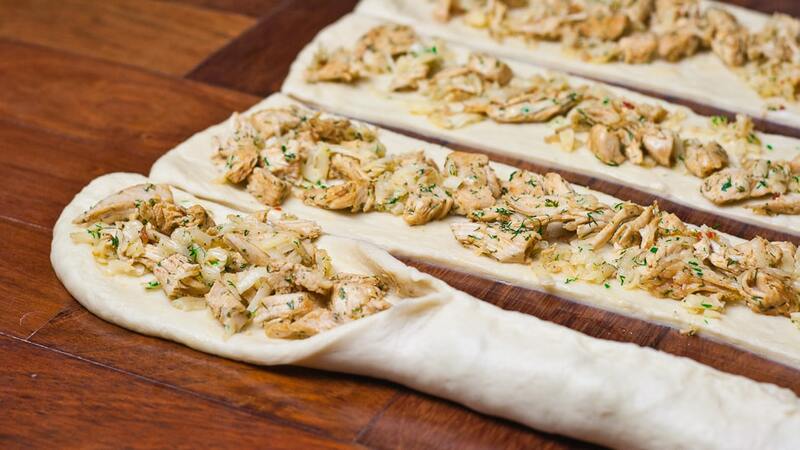 To make these delectable appetizers, first we need to make the dough. Get the yeast going, by mixing the yeast with the lukewarm water and sugar. Let it sit for a few minutes until it starts bubbling up. In the meantime, in the bowl of your mixer, add the flour and salt and quickly mix it together. Add the melted butter, the two eggs and the yeast mixture. Mix it all using the paddle attachment for about 3 to 5 minutes. The dough will be pretty sticky. Place it in an oiled bowl and let it rest until doubled in size, it took about an hour for me. While the dough is rising, you can make the turkey mixture. I used one breast which I cut into smaller pieces. In a skillet heat 2 tbsp of butter then add the turkey to it. Season the turkey with salt and pepper. Cook the turkey on all sides until it’s no longer pink. Take the turkey out of the skillet and chop it up in small pieces or pull it apart with a couple forks. Place the turkey in a bowl. Add the shredded asiago cheese to it, hot sauce, garlic chili sauce and dill. Mix everything well together. Let it cool. 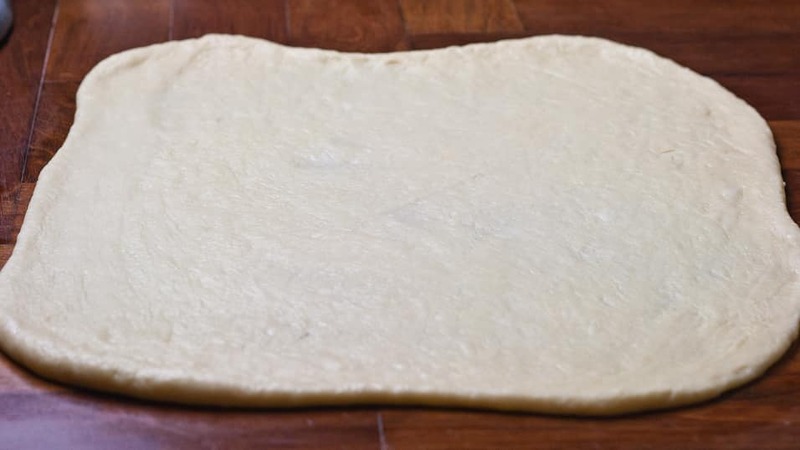 Take the dough and roll it out into a big rectangle about 2 feet by 1 1/2 feet. Cut the rectangle into 4 long strips. Take the turkey mixture and divide it in 4, spreading it across the length of the strips. 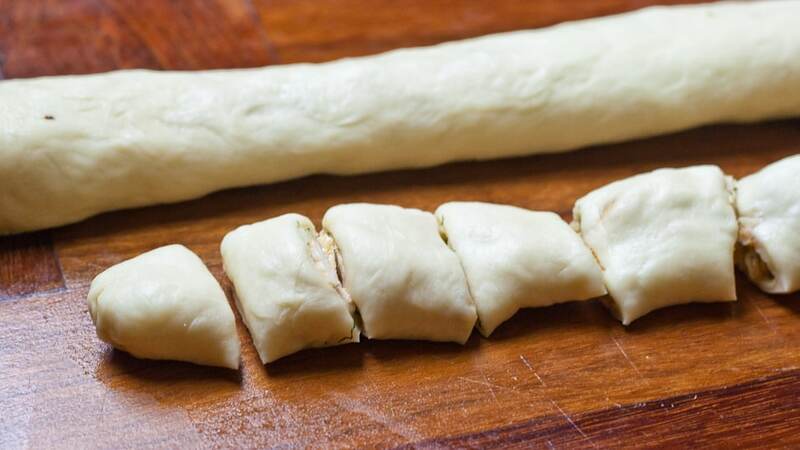 Next, bring the two sides together of each strip, pinching it together so that the dough sticks, and thus forming a roll. Repeat with all 4 strips. Take one strip and using a sharp knife, cut it into 1 inch pieces. 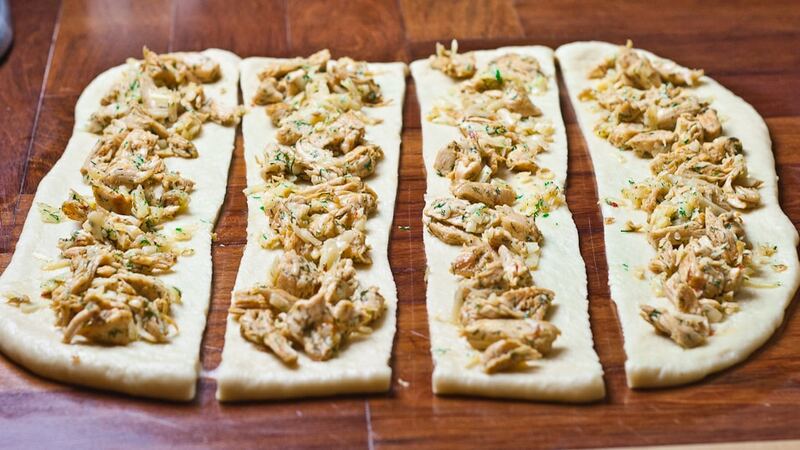 Place the pieces on a cookie sheet lined with parchment paper or a silpat. Brush the turkey bites with egg wash and sprinkle with sesame seeds. Bake in a preheated oven at 375 F degrees for about 20 to 25 minutes or until nice and golden brown. Now I served these with salsa, but you could eat them just by themselves. 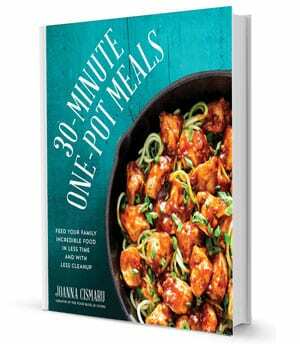 I hope you give these a try because they are very very good. 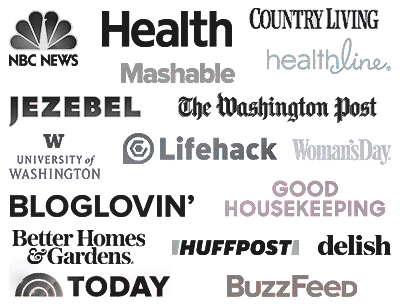 These turkey bites are about 7 weight watchers points for 5 bites. In a small bowl, combine the water, sugar and yeast together and let it sit until the yeast bubbles. In another small bowl mix the eggs and the melted butter. In the bowl of your mixer, add the flour, salt and mix. Add the butter/egg mixture and the yeast mixture and using the paddle attachment, mix it all together until everything is well incorporated. The dough will be fairly soft. Place the dough into an oiled bowl and rub some of the oil all over the dough. Let it rise in a warm place until it doubles in size. While the dough is rising, you can make the turkey mixture. Cut the turkey into smaller pieces. In a skillet heat 2 tbsp of butter then add the turkey to it. Season the turkey with salt and pepper. Cook the turkey on all sides until it's no longer pink. Take the turkey out of the skillet and chop it up in small pieces or pull it apart with a couple forks. Place the turkey in a bowl. Add the shredded asiago cheese to it, hot sauce, garlic chili sauce and dill. Mix everything well together. Let it cool. Cut the rectangle into 4 long strips. Take the turkey mixture and divide it in 4, spreading it across the length of the strips. 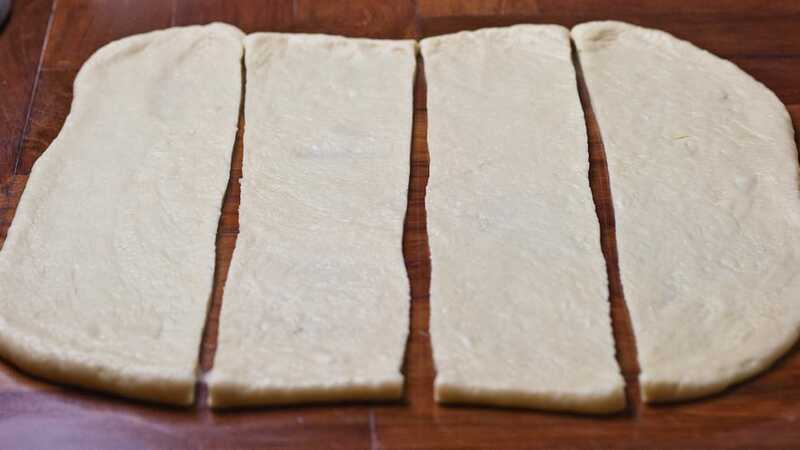 Next, bring the two sides together of each strip, pinching it together so that the dough sticks, and thus forming a roll. Wow, these look like a great appetizer!